The genus Thymus has about 40 species, but distinguishing between them is difficult. and carvacrol, adding up to about 70 % of the essential oil . 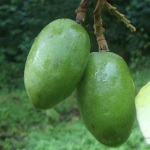 The high content of phenols makes the oil spore-killing and antiseptic. Thymol is also made synthetically. It forms large, colourless, beautifully opalescent crystals (mp. 51. °C). 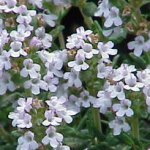 Thyme oil is sometimes used in masculine perfumes for its spicy, leathery effect. P.S. Lemon thyme, T. x citriodorus, a crossing between T. vulgaris and T. pulegoides, grows wild in southern France. It contains the terpenic aldehyde citral, and has a fine lemon flavour . Tiare is a national symbol for Tahiti, and for Polynesia in general. Men and women decorate themselves with its fragrant flowers on special occasions, at celebrations and ceremonies. 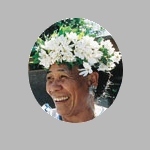 Tiare is a member of the gardenias. 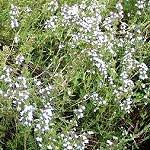 It thrives in the calcareous coral soil and grows wild in many Pacific islands. A perfumed oil called Monoi is made by letting newly picked flowers soak in coconut oil. One unusual odorant emitted by tiare flowers is phenylacetaldehyde oxime methyl ether. According to Müller and Lamparsky this chemical has odour notes in common with both phenylacetaldehyde, phenylpropionaldehyde and phenethyl methyl ether . N. alata and N. x sanderae. The tobacco plant (N. tabacum) is pictured on a Mexican temple relief from the first century A. D. Tobacco was cultured from Brazil to Mexico long before Columbus, and was brought to Europe by the Spanish explorers in the late 16. century. The knowledge of smoking tobacco was spread with the soldiers during The Thirty Years War. 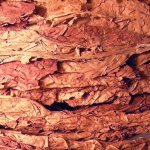 The flavour of the tobacco leaves has to be developed during a carefully controlled curing process by which a complex mixture of aroma compounds are formed, mainly from oxidative breakdown of carotenoids. A few characteristic compounds are shown above . 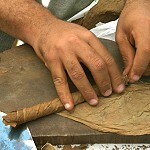 Variations of this process account for the many types of tobacco. Pipe and cigarette tobaccos are often additionally flavoured, two natural flavouring agents being extracts from sweetclover and tonka beans. 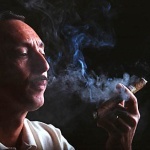 The active principle of tobacco is the alkaloid nicotine, which is produced in the roots, but stored in the leaves. It is a central stimulant in low dose - as in the smoke - but a strong poison in higher concentration. The L.D. 50 of nicotine in mice is 0.3 mg/kg i.v. . The carcinogenic properties of tobacco smoke is mainly due to polycyclic aromatic hydrocarbons (PAHs) - popularly called tar compounds - formed by uncomplete combustion. Etymology: Nicotiana, in honour of Jean Nicot de Villemain, in 1559-61 the French ambassador in Portugal. He sent a box of pulverized tobacco to Catherine of Medici as a cure against her migraine. Lat. tabacum, from West Indian 'tabaco'. P.S. Interestingly, Danny Kessler and Ian Baldwin at the Max Planck Institutet for Chemical Ecology in Jena, Germany, have demonstrated that tobacco (Nicotiana attenuata) 'uses' a low level of nicotine in its flower nectar as a 'smart' repellent. The presence of nicotine makes the visits by the pollinators shorter, thereby having more pollinators with the same amount of nectar . are held in clusters at the branch tips. They are purely white when they emerge from the buds and slowly age to a mellow creamy yellow. Their odor is somewhat reminiscent of that of orange flowers. 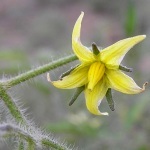 The flower volatiles of tobira have been subject to a few investigations using hydrodistillation and GC-MS  . However, a truer picture of the odor-determining constituents is achieved by using headspace trapping methods as done by Joulain , showing that myrcene, (E)-ocimene, alpha-pinene, linalool, 2-amino-benzaldehyde, benzyl acetate and indole are some of the most important odorants. Yet, as always, the relative proportions of the odorants may vary according to growth conditions and developmental stage of the flowers. Etymology: Gr. pitta, tar, Gr. spora, seed - because the seeds in the ripe, opened fruit are surrounded by a sticky mucilage. 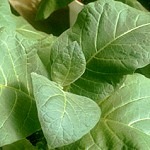 Tolu balsam comes from a South American tree, closely related to the tree yielding Peru balsam. 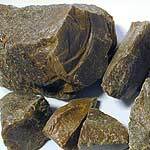 'Tolu balsam resinoid' is obtained by extraction of the raw tolu balsam. It is a brown crystalline mass with a persistent, sweet, balsamic odour, somewhat reminiscent of Hyacint. 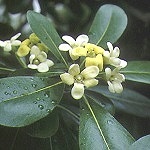 It is used as a fixative in perfumes. The main constituents of tolu balsam are the benzyl- and cinnamyl esters of benzoic acid and cinnamic acid. They are solid at room temperature . P.S. The aromatic hydrocarbon toluene (methylbenzene), widely used as a solvent, owes its name to tolu balsam. In the infancy of organic chemistry, experiments with 'distillation' of tolu balsam yielded 'toluol' by pyrolysis, later to be called toluene (see also benzoe). 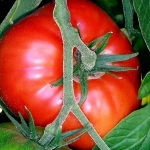 The tomato plant is mentioned here for one reason: the powerful smell from its green parts when touched. Especially the fruit-bearing stalks are so densely covered with glandular trichomes, that touching them leaves a strongly smelling green fluid on your fingers. The smell varies according to cultivar and growth conditions but is dominated by one highly characteristic odor impact compound, 2-isobutylthiazole . 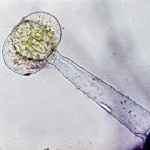 The bulbous glandular trichomes are visible as a reflecting glow from the stalk in the middle photo. The right photo shows a micropy of one of them. A 1 % solution of 2-isobutylthiazole in dipropyleneglycol is marketed as Thiazyl by pfw and described as having a dry green woody odour, reminiscent of 'eau de brouts' and petitgrain. The seeds from the large tree Dipteryx odorata growing in northern South America are called tonka beans. They contain coumarin in the form of a glycoside. When the seeds are fermented, coumarin is liberated in substantial amounts, often forming an "icing" of crystals on the surface. 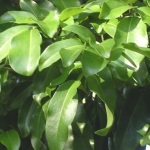 Coumarin was isolated and identified from this natural source as early as in 1820. 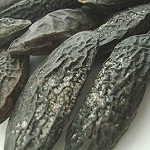 A tonka bean absolute is obtained by extraction of the seeds. 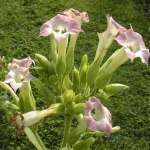 It is used in perfumery and in the flavouring of tobacco. It is a semi-solid or crystalline mass of pale amber or pale brownish-yellow colour. The odour is very rich, sweet and warm, distinctly coumarinic-herbaceous, with a prune-like or caramellic-sweet undertone. The absolute consists of 20-45 % coumarin, but the effect goes far beyond that of the coumarin contained in the absolute - according to Arctander (see end of references). 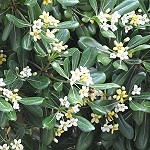 Minor components like dihydrocoumarin (with a sweet-herbal odor), 5-hydroxymethyl-furfural (with a cinnamon- and dried fruit-like odor) and methyl melilotate contribute to the unique tonka bean aroma  . Recently, tonka beans have appeared as a new "exotic" spice in fashion cuisine. However, coumarin is toxic by intake in more than minute amounts - see below! Etymology: In the local Tupi language the tree is called Tonka or Coumarou. Coumane ®, a cyclopropane analogue of coumarin from Flexitral, has just received FEMA GRAS status for use as a flavor. 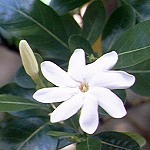 The odor is said to be strikingly close to that of coumarin. Octahydrocoumarin, marketed by IFF as Bicyclo Nonalactone, has a heavier and more coconut-like odor than that of coumarin. Methyl Laitone ® (Givaudan) is an extremely powerful odorant with a diffusive, milky, coconut-like coumarinic character. Cantryl ® (Symrise) surprises being a nitrile with a powerful, cumin-shaded coumarinic sweetness. Cantryl is announced as "coumarin's radiant sister"! Etymology: Cantryl, from campholenic acid nitrile.